Back in the early 1970s, a colourful collage of Dublin Georgian doors appeared in the window of the Irish Tourism offices on Fifth Avenue in New York one Saint Patrick’s Day. People on their way to see the parade were stopped in their tracks by the unique and colourful images. There were so many requests for copies that Joe Malone, then the North American Manager of Bord Fáilte, commissioned the poster that has since become one of the icons of Ireland. All the Georgian townhouses illustrating that poster are in the Merrion Square and Fitzwilliam Square area of Dublin. But as I walk through the streets of Limerick each week, I realise how a similar poster could have been produced in this city, illustrated with doorways from O’Connell Street and the Georgian houses in the streets off it. No 46 O’Connell Street, Limerick, is a terraced three-bay four-storey over basement former townhouse, built around 1800. The fine ‘Tudor’ or ‘Gothick’ shopfront was inserted at ground floor level about 1840, and is unique in Limerick. The Gothick rendered shopfront spans the entire façade of the building. It includes a tripartite window opening with three shallow pointed-arched fixed display windows, and a Tudor-arched door opening with a ribbed surround containing a double-leaf timber door that has Gothick slender flat panels and brass furniture. There is slender vertical glazing in the overlight above the door, with historic glass. The tripartite window is flanked by a pair of decorative Gothick panels above a similar panel below, and these panels are flanked by heavily moulded mullions with a low gabled pier to the lower panel that is corbelled out below. The mullions and piers are repeated at both ends of the shopfront and they support an entablature above with a modern fascia. The door opens onto a limestone threshold step and a limestone platform with six steps bridging the basement area. The steps are flanked by wrought-iron railings and cast-iron corner posts on a limestone plinth that encloses the basement area, accessed by modern steel steps. The Belltable Theatre at 69 O’Connell Street is housed in a terraced, three-bay four-storey over basement red brick former townhouse built ca 1825. This former Georgian townhouse was substantially remodelled at ground floor level as the Coliseum Cinema in the late 19th century. It has since become one of the most important venues in Limerick for the performing arts. The theatre was built around 1890, and the limestone ashlar ground floor elevation dates from about 1900, when the theatre was remodelled by the Limerick-based architect William Clifford Smith (1881-1954). The smaller of the two openings is recessed within a porch reached by a broad flight of limestone steps. Here there are double-leaf margin-paned glazed timber doors, with a moulded architrave and a diamond and circular paned glazed fanlight. The limestone flagged front door platform is reached by a flight of limestone steps flanked by the original wrought-iron railings with neoclassical cast-iron rail posts that have pineapple finials. The larger doorway is level with the footpath and is flanked by Tudor-style piers on fluted pedestals. These support a limestone arch with glazed spandrels divided by limestone mullions, imitating the glazing pattern of the fanlight. A highly elaborate, three-centred arch doorcase and fanlight can be seen at 72 O’Connell Street. This is a terraced two-bay four-storey over basement red brick former Georgian townhouse built around 1825. The house is one in a terrace of 11 relatively uniform large-scale houses each sharing a uniform parapet height and window pattern. The terrace is between Hartstonge Street and Mallow Street and forms one of the most noble street elevations in Limerick. The tripartite doorcase includes four pilasters that are enriched by carved or composite gesso-moulded caryatids to three sides of the pilasters, inspired perhaps by the Caryatids at the Erechtheion beside the Parthenon on the Acropolis Hill in Athens. It is worth remembering that these doorways were produced at a time when Lord Elgin had hacked away large portions of the Parthenon frieze and brought them to London, where they were sold to the British Museum. The pilasters at No 72 are further elaborated by egg-and-dart detailing that is joined by timber entablatures. The frosted glass sidelights over the panelled timber bases survive, and the original flat-panelled timber door leaf has a Wellington door knocker. Above, there is a lead-detailed webbed fanlight. No 77 O’Connell Street is another house in this uniform terrace of 11 Georgian former townhouses. It too was built around 1820, and has a broad flight of steps leading up to the three-centred arched front door. The house still has a fine Georgian doorcase with a rare example of a fanlight lantern. It contributes significantly to the architectural character of the streetscape in this part of Georgian Limerick. The house has a three-centred arched door opening, a red brick arch, patent rendered reveals, and an inset tripartite timber doorcase. Here palmette enriched piers divide the flanking sidelights which have panelled timber bases incorporating historic bell ringers. The original flat-panelled timber door has a central horizontal panel. Piers support the frieze and cornice with waterleaf detailing. The original webbed lead detailed fanlight incorporates fanlight lantern. No 87 O’Connell Street is a terraced two-bay four-storey over basement brick former townhouse, built around 1840. Here there is a brick three-centred arched door opening with a rendered reveal and a replacement timber-panelled door. The door at No 87 is flanked by pair of timber engaged Ionic columns, replacement sidelights and pair of quarter Ionic piers, all supporting a stepped entablature with a replacement fanlight above. No 96 O’Connell Street is the offices of Limerick Chamber of Commerce. This is a terraced three-bay four-storey over basement former house, built around 1800. It was refaced in stucco around 1875-1880 and is distinguished by the channel rusticated ground floor elevation, the foliate frieze on the parapet entablature, the cast-iron balconette and the piano nobile window openings. The segmental-arched door opening has a surround treatment that echoes the window openings at ground level. The inset timber doorframe has a profiled timber lintel separating the plain glass overlight from the flat-panelled timber door. The remains of the brick arch of the original door opening is evident on the neighbouring late Georgian façade. This fine building is remarkable for the way the early 19th-century interior is intact behind the later 19th-century stucco façade. 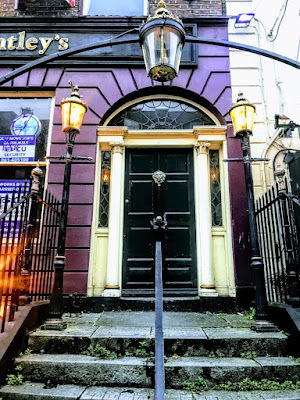 Next door, 97 O’Connell Street is worth looking at because of its unusual front door. The lettering in the fanlight proclaims that this was once the Limerick Protestant Young Men’s Association. The association was founded in 1853 to provide and maintain suitable premises and grounds to encourage literary and scientific study, cultivate artistic taste, create good fellowship, and provide spiritual, moral, social and physical improvement among its members. The LPYMA moved to 97 George’s Street (later renamed O’Connell Street) in 1875. A new gymnasium and a lecture hall were added two years later. The LPYMA was governed by a president, vice-presidents, treasurer, secretaries and a committee of 13 elected. The clubs included hockey, lawn tennis, cricket and bowls, and in 1938 they amalgamated into a unified Sports Club. The association also had a billiards room, and a large library and reading room. Women were eligible and were exempt from the subscription fee if they a male relative was also a member. The association’s popularity began to wane from the 1960s onwards. It remains in existence but mostly in an administrative capacity to oversee the maintenance of its premises. The archives are now at the University of Limerick, but are purely administrative and reveal little of the association’s temporal and spiritual work. No 99 O’Connell Street has considerable street presence in the city centre because of its original doorcase and the curved elevated approach. This is a terraced three-bay four-storey over basement former townhouse was built around 1810. For many decades, it was known as the Limerick Institute, a club with its own library and newsroom. There is a brick three-point arched door opening with the original timber-panelled door. The door is flanked by a pair of engaged timber Ionic columns, the original sidelights and quarter Ionic piers, all supporting a stepped entablature with a decorative webbed zinc fanlight above that still retains some historic glass. One of the wonders of Georgian Limerick was William Roche’s ‘Hanging Gardens,’ which extended from 99 O’Connell Street as far as Henry Street. Roche erected a series of storehouses behind the house at a cost of £15,000 in 1808. The gardens were laid out over the vaulted storehouses, and the highest of these gardens was 70 ft above the street and was about 200 ft in length. The top terrace contained hothouses where Roche grew grapes, pineapples, peaches and oranges. The middle terrace included vegetables and hardy fruits. The lower terrace was rich with flowers of every form, scent and hue. No 101 O’Connell Street is part of a terrace of seven buildings and most of its door surround remains intact. This terraced two-bay four-storey over basement brick former townhouse was built around 1810. The building has a segmental-headed front door opening, where the original timber-panelled door is flanked by a pair of engaged timber Ionic columns and replacement sidelights supporting a stepped entablature, with a replacement fanlight above. These are just a few of the former townhouses on O’Connell Street that enrich the streetscape of the Georgian heart of Limerick city centre.